A NEW gin made with juniper berries plucked under moonlight from the Lakeland Fells has scooped a top award. Pennington’s Lakeland Moon Gin, a traditionally distilled London Dry Gin, won a silver award from the International Spirits Challenge 2017, in which a team of professional tasters test drinks from all over the world over seven days. The award for “outstanding achievement and underlying producers’ commitment to quality and innovation through the spirit” will be presented at a grand London ceremony on July 12. The accolade comes less than two months after the gin went into production but follows two years of the behind the scenes planning by a Kendal-based team. 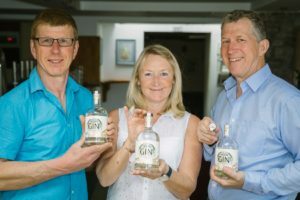 Burgundy’s Wine Bar owner Mike Pennington, his partner Annie Brownhill and his brother Fred Pennington decided to enter gin production after the success of their Kendal Mintcake Liqueur. They now plan to produce an organic vodka and other spirits. “There has been a real revival in interest in gin, but there are so many gins out there we wanted to produce one good enough to stand out from the crowd. 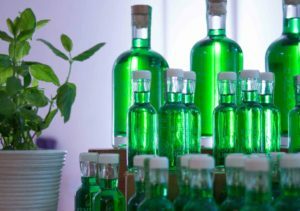 “Many have flavours added after the production, but ours uses the traditional art of gin making, including a 100-year-old copper still, said Mike. The legend on the bottle says: “Our gin is a unique blend of wild juniper and botanicals, gathered from the Lakeland Fells under a full moon. It is blended with water filtered through limestone beds from our own Lake District National Park Spring. The 42.1% proof gin retails at £31.50p for a 50cl bottle. Picture by Steve Barber: Fred Pennington, Annie Brownhill and Mike Pennington with their award winning Lakeland Moon Gin.